Wood pallets are recyclable and repairable—both of which are excellent points for the environment! 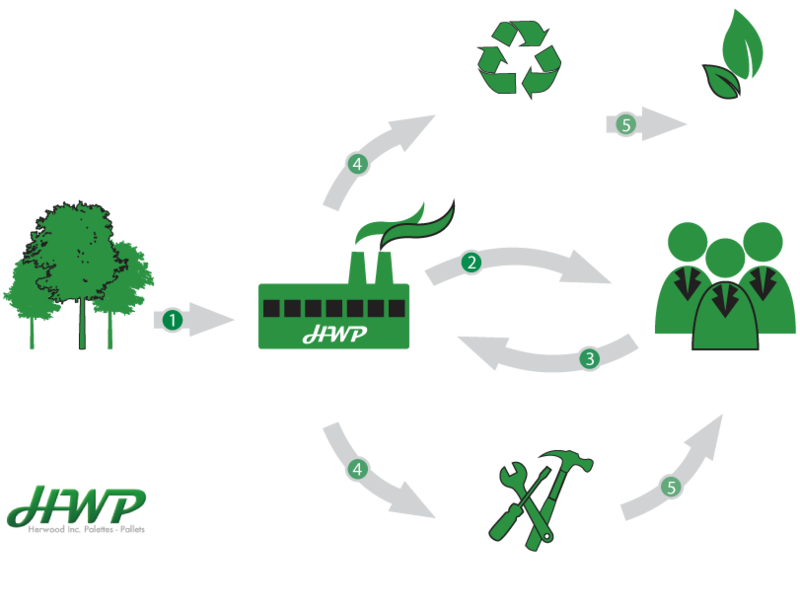 Herwood Inc. not only offers a comprehensive pallet recycling program, but we also provide pallet repair services. Pallet repair is a key component in our eco-friendly pallet manufacturing and distribution services. These services allow the pallet life-cycle to continue even longer and help to further minimize the impact on our environment. Whether you maintain your own pallet inventory or you take advantage of pallet pooling, Herwood Inc. will repair your wood pallets and save your business time and resources. Shipping is hard on materials and equipment; and pallets bear the brunt of that wear and tear. Once a wood pallet enters the shipping stream it travels to its destination (by truck, plane, train or boat); will be transported through the yard and warehouse with forklifts and skid-lifters, then be parked in storage and eventually unloaded of its goods. Once unloaded, it is sent to a pallet storage area for pickup and return. Throughout this cycle, many pallets are damaged or broken. Between 80-90% of wood pallets will require repair and about 10-20% will be sent straight to recycling. That’s where Herwood Inc. comes into the picture. We will pick up and transport your used wood pallets to our facility for repair or recycling. Once pallets arrive at our repair facility, they are inspected, repaired, cleaned and returned into circulation. You will receive a credit for usable (GMA 48 X 40) pallets and lose the hassle of dealing with the broken ones. We also provide the storage space to handle large inventories of pallets, saving you from having to store them on-site; simply keep the ones you’ll use. Damaged pallets can pose many risks to the safety of their loads as well as the people working with them. Decreased strength tolerances, sharp edges or missing hardware can cause accidents or injuries. It’s also important to ensure that pallets meet ISPM 15 requirements. Using Herwood Inc’s pallet repair service means that wood pallets can efficiently be repaired and returned into circulation; allowing convenient cost-savings to your business and ensuring the safety of both personnel and the goods being shipped. Replace any and all deck boards, stringer boards or stringers that are broken across full width, height or thickness. For block pallets, no wood may be missing in the butted connections, repair as necessary to maintain integrity. Tighten or replace any loose materials. Check for missing nails/fasteners.Replace or repair any metal plates, fasteners or other components that need it. Exposed fasteners, nails or other components must be made flush with the pallet exterior. Non-compliant components (for ISPM 15 pallets) replaced and repaired with heat treated wood and materials that meet current requirements. Repair twisted or warped pallets.